Dagfinn Paust (1881 – 1963) was born and raised in Sandefjord, Norway as one of four children. He was son of skipper Otto Paust and wife Emma Paust born Lyhman. 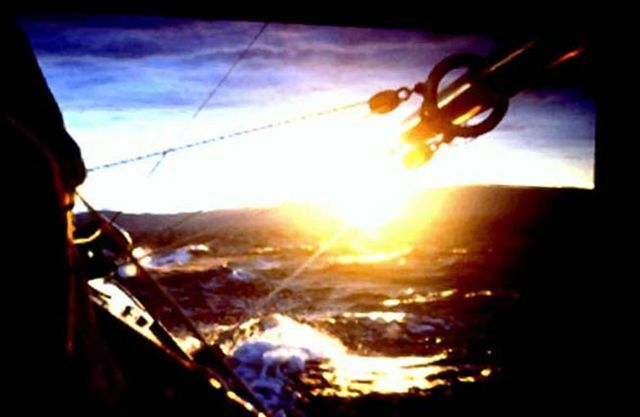 Fourteen (14) years of age Dagfinn went to sea as a sailor. He graduated later as officer. After serving at sea he went onshore, setled down in Oslo and was employed by various shipowner companies before he became partner in Fearnley & Eger and founder of Intertanko. In 1917 Dagfinn Paust became a member of Royal Norwegian Yachtclub, KNS. Dagfinn Paust married Constance in 1919. They got two children, Dagfinn Crawford (Dagfinn Paust jr. 1923-1989) and Dagny. In addition to the sea Dagfinn Paust enjoyed outdoor life. In 1922 Dagfinn Paust acquires 8mR “Siva” ex “Verano II” from Nicolai Andresen jr. and names her “Danseuse” Her R-certificate is renewed June 1st 1922. (ref. “Snarken history part II”). Dagfinn at the helm onboard 8mR "Danseuse" with Dagfinn jr (II). Lloyds Register of Yachts 1924 (reflecting 1923) has "Danseuse" (ex Siva, ex Verano) owner; shipowner Dagfinn Paust, Christiania (Oslo). Design Johan Anker. 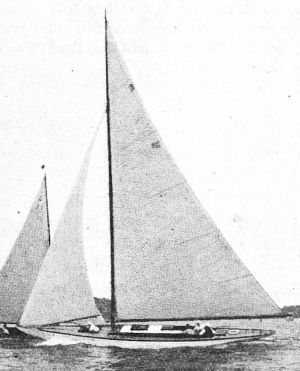 Constructed Anker & Jensen AS, 1920 (info Jan Haugerud KTK). 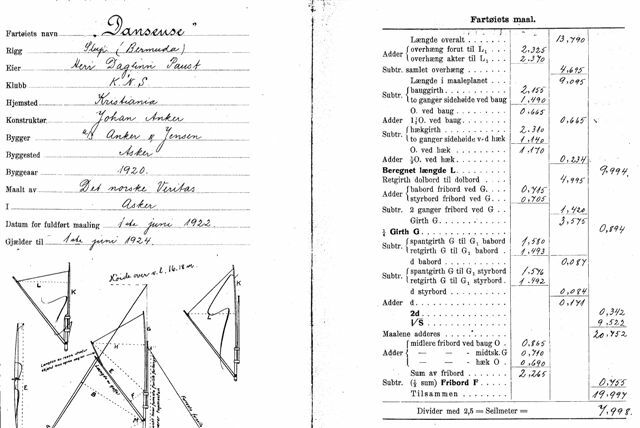 For Dagfinn Paust and his family, 8mR “Danseuse” is succeeded by “Danseuse II” and in 1927 he acquires 12mR “Danseuse III”, designed by Johan Anker and constructed by Anker & Jensen in 1911 for Sam Eyde, named “Beduin”. Shipowner Ole Röed Thoresen who in 1921 previously owned “Verano II” after Eilert Sundt resumes in 1924 the ownership of 8mR "Danseuse" after Dagfinn Paust, and names her “Fandango II”. In 1926 Dagfinn Paust is President of Oslo shipowners association. 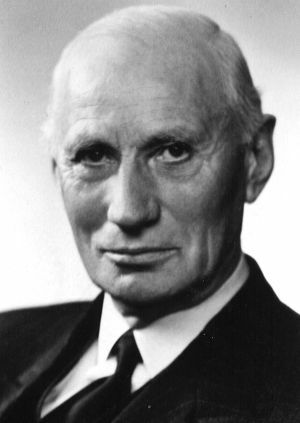 Dagfinn Paust hold the position as President of NSSR (Norwegian Society for Sea Rescue) for 16 years from 1931 to 1947. During his Presidency the rescue vessels converted from only sails to engine. For his work Dagfinn Paust was honored by RS 103 “Dagfinn Paust” carrying his name. 8mR “Danseuse”, ex “Siva”, ex Verano II”, how she appeared when certified to the new international R-rule in 1920, and certificate renewal 1922. 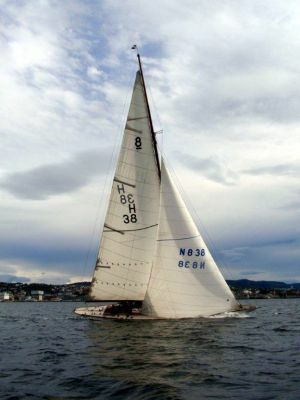 She was modified to new international, with cabin roof and new sail plan. Among other converted S-Eights, were Ankers own 8mR “Brand V”, 8mR “Apache” and 8mR “Rocambole”.